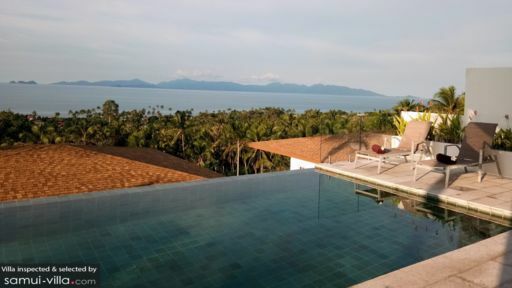 Located on the hills of Samui, with a view that spans across Bang Por bay, Villa Asia is a stunning, six-bedroom retreat within a private estate that is home to six, private villas. Equipped with five-star amenities including a 14-metre swimming pool with infinity views, alfresco dining on the deck, and modern services, the villa is a perfect place to stay at with loved ones while on holiday. While enjoying the tranquillity and peaceful ambiance afforded by this splendid location, the villa is great for relaxation, fun, and some meditative moments where it’s just you, your family, and the abundance of nature! Perfect for large gatherings, Villa Asia hosts six, excellently-appointed bedrooms that sport elegant and minimal décor. Three are found on the second floor, while three are located on the ground floor. Furnished with king-sized beds and one with three single beds, the bedrooms are comfortable and the upstairs rooms even lead to a private balcony with ocean views. Air-conditioners help keep the temperature at a comfortable level so you can relax in your own haven. Alongside the bedrooms, there are en-suite bathrooms that are outfitted with excellent facilities including a shower and/or bathtub! Opt for a BBQ outdoors beside the swimming pool for a deliciously fresh grilled meal with friends and family. There is a 14-metre swimming pool which sports an infinity edge so you can enjoy a splendid view across the verdant foliage to the ocean. Towering palm trees surround the villa that you can peek through to view the expansive view. There are sun chairs out on the pool deck for when you wish to lounge after a refreshing and calming dip in the pool. A small outdoor table serves as a nice spot for a morning or evening tea! 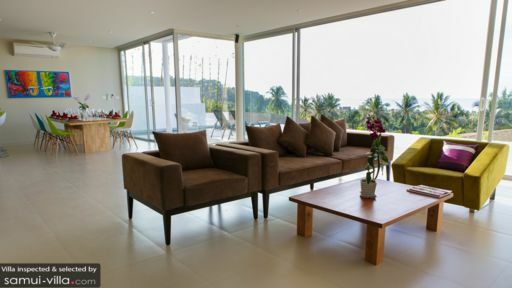 A gorgeous living area lit up by the afternoon sun that shines through the glass doors greets you at Villa Asia. With a view to kill, you can enjoy a hearty view from the comfortable couch that stands in the centre. There is a wall-mounted 55-inch flat-screen TV with DVD player for your enjoyment. Artwork that has been handpicked graces the walls of the living area. Since the room is air-conditioned, you can stay in if you prefer a cooler climate especially during the afternoons. A dining table with colourful chairs is set up in the room as well so everyone can enjoy hearty feasts alongside their loved ones. There is a fully-equipped kitchen in the corner of the living room which has been fitted with all modern amenities and appliances. An island counter provides additional space for people to relax. For a luxurious and wonderful experience, the villa ensures that each guest is happy and content with the amenities and services provided by the villa as well as the estate. There is a tennis court, gym, and other areas that are accessible to guests. Housekeeping and security is taken care of and all you need to worry about is having a great time! If you want to visit Bang Por city, take the free shuttle provided by the estate. 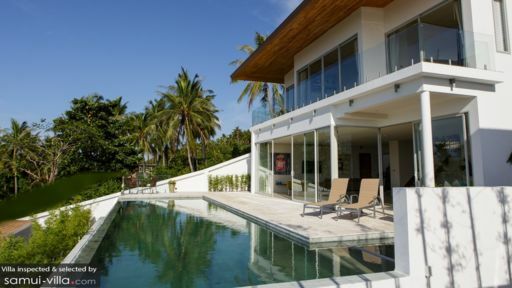 Close to the ocean, the villa is perfectly located so you can enjoy the beach whenever you wish. For some good old fun under the sun, this would be the ideal location if you ever just want to unwind and disconnect. There are restaurants and beachside bars where you can grab a chilled beverage and sit for hours just listening to the crashing waves!